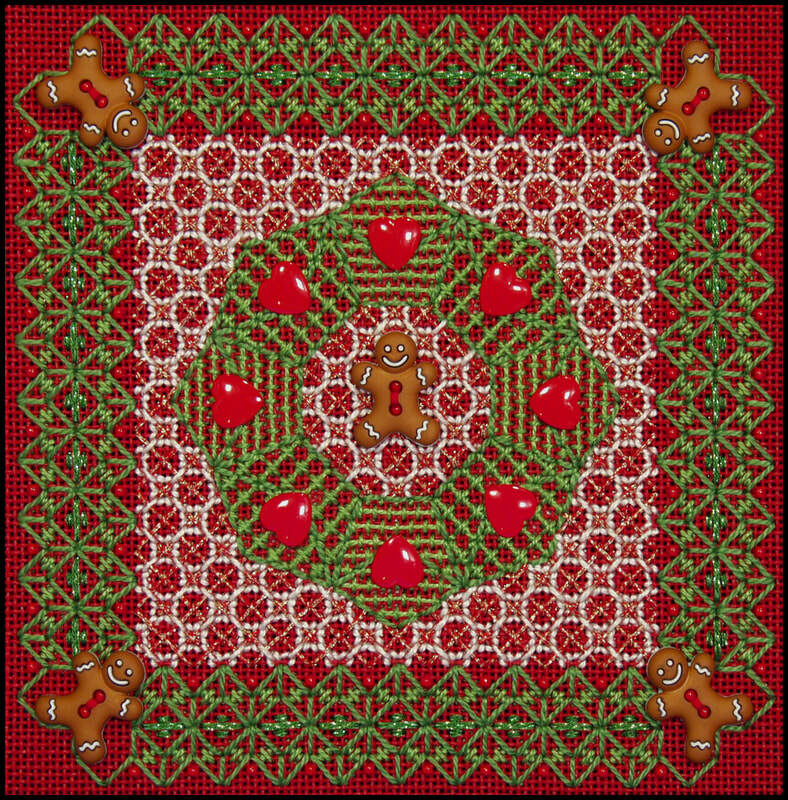 ​Gingie Wreath was originally stitched for our family Christmas card — a tradition we have continued for several decades and some of these designs have become class projects. All of the patterns in this design are examples of different styles of open patterns so it is a good vehicle for learning to execute these patterns properly. Unusual sequences were developed in order to both conceal the traveling threads and to minimize the number of starting and ending tails since areas to secure these thread tails are more limited in open patterns. These two goals are not high priorities in solid canvas fillings but in my mind they are mandatory in open treatments to achieve an attractive presentation. Wreath outline and Step 1 of the border in one quadrant. Estimated time 3-4 hours. All materials needed to complete the ornament plus a detailed instruction booklet with a color copy of the finished model on the cover and a detail view of just the ornament. 12" X 12" stretcher frame, embroidery scissors, laying tool, clamp or frame weight to secure stretcher frame to working table, plus any other normal accessories needed to work on 18-count ground (light, magnifier, etc. ).